Chagall was born in 1887 in the town of Vitebsk, Russia (now in Belarus). He attended a traditional Jewish school and a Russian high school, moving to St Petersburg in 1907, where he studied at the Imperial School for the Protection of the Fine Arts, and later at the Zvantseva School, led by Léon Bakst. In 1910, Chagall arrived in Paris, where he settled at La Ruche and met other Jewish artists including Modigliani, alongside key figures in French modernism including Guillaume Apollinaire and Robert Delaunay. Chagall's first solo exhibition took place at Der Sturm Gallery in Berlin, in 1914. That same year, he returned to Russia to visit his family. While he was there, the First World War broke out, preventing his return to Paris. Following the Bolshevik Revolution in 1917, Chagall was appointed Fine Arts Commissar for the province of Vitebsk, but in 1922 left again for Berlin, where his work was published by the periodical Der Sturm. He returned to Paris in 1923, where he stayed until 1940, becoming a French citizen in 1937. Chagall frequently used animals for symbolic purposes in his dream-like paintings that brought together aspects of French tradition with Russian folklore. Chagall sought refuge in New York during the Second World War, where a major retrospective of his work was held at The Museum of Modern Art in 1946. He stayed in America until 1948, then returned to France, settling in the south-eastern town of Saint-Paul-de-Vence in 1952. In later life, Chagall produced stained-glass schemes for churches, including the chapel at Tudeley, Kent. He died in Saint-Paul-de-Vence in 1985. Apocalypse en Lilas, Capriccio was unveiled at a special exhibition to mark its acquisition, at Osborne Samuel in Mayfair in 2010, with a new text by Chagall expert Professor Ziva Amishai-Maisels. Chagall's work was first exhibited at Ben Uri in 1934 and has since been shown on numerous occasions including Chagall and his Circle (2006) and From Russia to Paris: Chaïm Soutine and his Contemporaries in 2012, reconfigured as Soutine, Chagall and the School of Paris at Manchester Jewish Museum in 2013 simultaneous to the major Chagall show at Tate Liverpool. Most recently, it was loaned to the important Chagall retrospective in New York (2013), Milan (2014) and Brussels (2015). 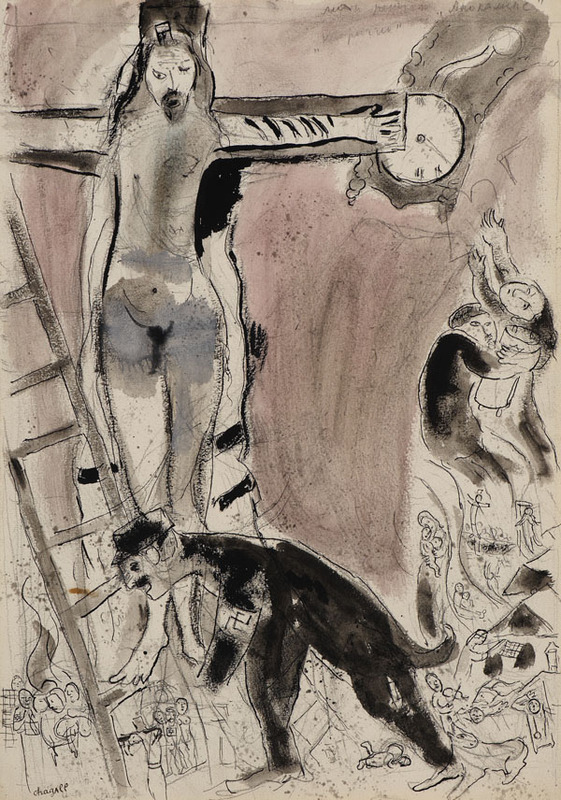 This important gouache, ink and pencil study was most likely executed in April 1945 when Chagall was in exile in New York due to the Nazi occupation. It was probably the first work he produced after coming out of mourning for his late wife, Bella (who had died suddenly in September 1944), and was created in direct response to seeing the horrors of the concentration camps revealed through newspapers and Pathé newsreels. Previously, Chagall's crucifixions had symbolised the Nazi's Jewish victims in order to remind Christians that Christ was a Jew and they should stop persecuting his brothers. However, here Chagall incorporates factual information about the Holocaust for the first time. The clock in the top right of the study is missing its minute and hour hands, casting this moment in history as the end of time - the apocalypse. Below, a series of complex and horrific scenes uncover the extent of Jewish suffering during the Holocaust, among them another crucifixion, a hanging and a boatload of refugees.